SYNOPSIS: In the 1990s, heavy metal band Dürt Würk was poised for breakout success — but then lead singer Terry Hunt embarked on a solo career and rocketed to stardom as Koffin, leaving his fellow bandmates to rot in rural Pennsylvania. 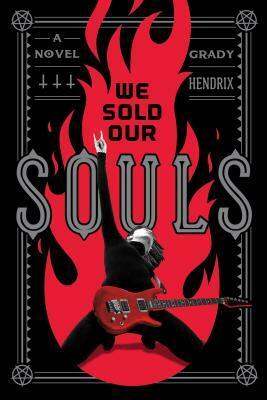 I’d been meaning to read something by Grady Hendrix for ages, so I jumped at the chance to review We Sold Our Souls. I’d heard so many of my friends rave about his writing in general, but as a metalhead, I was especially sold on the idea of an entire horror story revolving around this washed-up former metal star and her old bandmate’s essential deal with the devil to gain his fame. She had nothing. Except her music. First, let’s talk about Kris Pulaski, our former guitarist protagonist who’s in her forties now, working the night shift at a hotel, miserable, empty, and alone. And let’s talk about how much I freaking love her. Kris is an absolute badass, full of flames and rage and a need for vengeance and justice; she’s tough, a total fighter, and frankly, she’s sick and tired of being held down by the men in her life. She’s incredibly aware of how warped the metal community’s treatment of women can be, much less how society at large treats powerful and self-confident women, but she refuses to let anyone get in her way for even a second. She’s constantly plotting her next move, and she’s just brilliant. If Kris Pulaski were a real person, I’d want to be her best friend. Kris had been alive long enough to know it was dangerous when men accused you of being better than them. Kris isn’t the only enjoyable character, though—even some of the bad guys are pretty likable in their own way, and everyone, good or bad, feels flawed and authentic. I loved cycling through Kris’ former bandmates as she met up with each one, and learning about her memories of them, especially when she would couple in band-specific relations (things like, “like every guitar duo in metal, they were a little bit in love and a little bit in hate all at the same time”). It’s also incredibly fascinating to watch Kris piece together her broken memories as the story slowly reveals what drove apart the members of Dürt Würk, and why Kris has been an outsider ever since. She played for the losers. While We Sold Our Souls absolutely has horror elements and a wonderful plot that kept me engaged from start to finish, what I loved most about it was the fact that, at its core, it reads like a love song to metalheads and music lovers everywhere. So much of what happens revolves around the music scene, the power of metal (and the darker sides of the community, too), and the ways that music can teach us and guide us to the light. There are loads of pop culture references (don’t be offended if a few of your faves get insulted—it happened to me twice, and all I could do was laugh), feminist undertones for days, and a few incredibly creepy (and/or disgusting) mental images that have followed me in the days since finishing this story. Altogether, I adored every single page of this book, and see it as the kind of story I would happily read over and over again in the future. If you enjoy horror with a touch of weirdness to it, and especially if you’re a fellow metalhead, I can’t urge you strongly enough to pick up a copy of We Sold Our Souls right away. There’s not a single negative thing I have to say about it, and I can’t wait to read everything else Grady Hendrix has to offer. Thank you so much to Quirk Books for providing me with a stunning finished copy in exchange for an honest review! Thank you so much! It was so good. What did you think of the big ending scene? I was geeking out so hard lol. I love how in-depth it was with the full album. It was wrapped up so well and I love the message it gave. V powerful and so much fun to read!! Yessss, I think I put that in my autumn TBR jar and I’m really hoping it ends up being one of the titles I pull soon, because it sounds like so much fun! 😀 I can’t wait to hear what you think of this one. I’ve never heard of this book before but the synopsis sounds so out of the box and badass. Out of the box and badass PERFECTLY sums this book up haha! Thank you, Shannon! I definitely think someone who isn’t into metal could enjoy it too, so don’t worry if you want to pick it up. 🙂 You just might not appreciate some of the references as much! Thank you! 🙂 This was my first of his, but I’m really looking forward to checking out some of his other works next. I hope you do! I haven’t read his other books to compare it to but I thought it was so fun! YAS! So glad to see you gave this one 5 stars! I’ll be reading it soon too and loooooove Grady Hendrix’s books! I read My Best Friend’s Exorcism, Horrorstor, aaaand Paperbacks from Hell last year and they were all just so good! This book seems to be popping up everywhere right now and I’m kind of intrigued by the good reviews it’s getting. I’ve never tried the author but might just have to! Great review! I hope you do, it was such a fun read! Thank you so much!